For anyone reading this south of Maine, this post is what swimsuit shopping is to swimsuit season: pure fantasy. Do I really believe we'll lounge decorously on our patios this August, sipping tart lemonades or the rare julep? Will we exchange bright conversation under a dimming sky, as neighborhood children find fireflies? Heck, no, honey. We are going to swelter. Because it's hotter than Dante's sixth ring out there, and the mosquitos are closing in (Is that fever I feel the heat index, or West Nile Virus?). Just settle back into the easy chair you pulled next to the open fridge door, and enjoy these beautiful spaces for outdoor living. 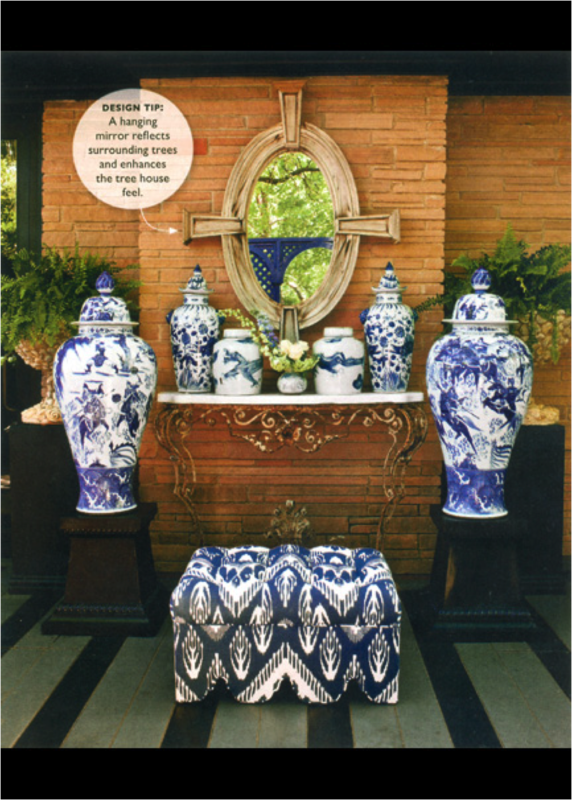 Miles Redd, Architectural Digest. Redd may be the toast of New York, but he was raised in Atlanta, and Southern shows. There's enough wicker here to deplete a factory, and a few dozen kids, dogs, and stray neighbors would fit right in. The white floor keeps it modern. Michelle Nussbaumer of Ceylon et Cie, Southern Living. If you have the money to spend on good porcelain, always buy it in bulk and display it as precariously as possible. A few spindly bits of rusting iron and some wobbly stands will give the impression you don't hold the Ming too precious. Don't quote me, but I believe the fabric is from Kravet (and comes in a rich green, too). Note the fabulous navy trellis in the reflection; I wish we could see what the rest of the garden looks like! 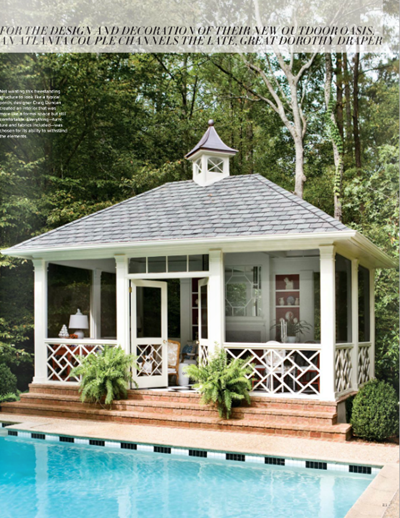 Craig Duncan, Southern Living. I hope they named this place "Little Greenbrier" - Duncan does Draper without copying Draper - it's a fine balance, and he doesn't fall. It LOOKS air-conditioned, anyway: crisp, cool, and not a thread out of place. Don't miss the urn lids turned finials, the Draper-esque trim on the mirror, or the fretwork inside the fireplace. I just hope I get to visit in January. Love your post -- and what a lovely fantasy for me today living in the Dallas heat and the West Nile Alert. Happy Monday!